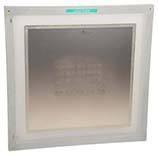 Stencils are designed for prototyping and with the flap protect solder from migrating to other areas. Shipped fast. Comes with PCB holders and properly-sized squeegee. A deep and wide selection of different frames available. High quality stainless only. Check plots done by staff with lots of experience. Leverage the experience of our rework engineering team to print solder paste directly on to parts. These are well-designed and made rework stencils.